Ford is promoting the all-new 2011 Ford Explorer with “Crazy Kevin”, a television commercial set in an outdoor wedding reception. 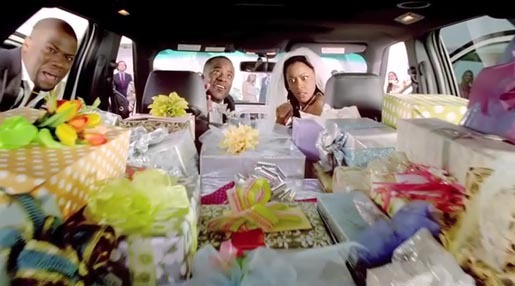 Comedian Kevin Hart turns up in a white Explorer, swipes the family patriarch’s microphone to celebrate the union of crazy technology and crazy cool, taking the guests through the benefits of his new ride. As Hart shows off the roomy cargo space and talks up the terrain management option, we’re shown scenes of the SUV charging along beaches and up hills. The spot wraps with a flummoxed Hart sprinting after the newlyweds, who have sped off in what they assume is their wedding present. The Crazy Kevin ad was developed at Uniworld Group by executive creative director Quincy Cherry, copywriter Demetrius Hill, art director Wisdom Tucker and executive producer Marjorie Clarke. Filming was shot by director David Kellogg via Anonymous Content with director of photogrpahy Larry Fong, executive producer Danielle Peretz, executive producer/head of commercials Dave Morrison, producer James Graves, production supervisor Hope Dotson. Editor was Chris Franklin at Big Sky Editorial with assistant editor Candice Hick and producer Cheryl Panek. Colorist was Chris Ryan at Nice Shoes. Post graphics were produced by Ryan Sears. Music is by APM. Sound was designed by Chris Franklin at Sound Lounge and mixed by Keith Reynaud.